The Ordinary Life of an Extraordinary Girl: "I am a party animal"
"I am a party animal"
Most mothers of 18 year old girls would cringe to hear those words uttered, but not me. Most mothers of 18 year old girls do not have a daughter with down syndrome, but I do. Alex is not able to create an active social life as well as her older sister can. Certainly she can ask other kids to do things with her, and try to insert herself in others activities, but she is not successful. I go back to my soapbox about awareness and inclusion. I do not think kids are excluding Alex by design, my gut tells me it is due to a lack of awareness. Perhaps, if our kids were taught at a young age about the gifts all people have to share, this would not be the case. But this is not part of a child’s experience growing up, and the idea of saying “no” to a person like Alex, or excluding her from a party is very common. I have not written much about Alex and school this year. She has the same case manager as last year and is included in four classes with an aide and modifications. Her speech was upped to 1 ½ hours per week due to my constant nagging (to other parents – I still do not think this is enough). Her counselor, her speech therapist and her case manager are all coordinating to help Alex on her college applications. These are all good things, but it is the people that are working together that need to be commended, the culture of the school has not changed yet. But as far as other students actively engaging Alex in out of school events, it does not happen. Yes, Alex is the manager of the football team and for these two months she has been welcomed and included by a lot of teenage boys. But, football is almost over, and basketball is next up….along with all the trauma of a girls sports team. This makes me cringe. I digress, as strongly as I feel about inclusion, I feel even more strongly about Alex’s happiness. Alex is a party animal - she is funny, silly, charming and kind. She lights up any room she walks into and people feel her warmth and energy. I am sad she does not have the chance to share her glow often; it is an opportunity unrealized for our community. Caveat – she DOES have bad days, and they can be really, really bad - just like mine. But like all of us Alex gravitates towards similar people, and is one of the reasons Special Olympics have been so important to her. Taking Charge introduced her to other young adults with disabilities, and we have been able to keep those relationships going through the hard work of those parents and the Special Olympic families. It is fulfilling for Alex and all of us families to see our kids so engaged and happy. So when Alex said “I am a party animal”, she did not mean she was invited to a school party, or another "normal” teen event. Alex was invited to two parties on the same day, with similar peers. Per Alex, I was NOT allowed to attend, but I enlisted spies, just like I do with my other kids, and Alex was a party animal, just as she bragged. 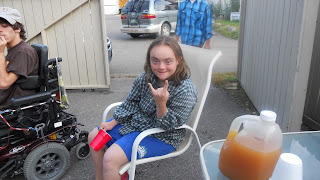 Alex does not care about others disabilities; she looks at everyone from the same perspective. Alex appreciates everyone for their quirkiness, humor and kindness. Alex just wants to have fun - Isn’t there a lesson in this for all of us? This post describes our life exactly. Beth can be so funny and friendly at times, but doesn't get invited out like her sisters do. Beth's social calendar depends largely on Chuck and I, our schedules, availability to drive her to and from, plus just making the connections. It's hard. Hopefully with more awareness and more visibility of younger kids with Ds, things can only get better. You definitely rock the house like all party animals do! And Cindy, I so agree about visibility. I wonder if there were lots of post-Buddy Walk events? Yay for kindness and quirkiness and humour.